From the top of a towering pagoda just outside Tongren, in Qinghai, northwest China, one can see the encroaching spread of high-rise apartments towering even higher in the valley below. A remote county located on the edge of the Tibetan plateau, Tongren was first settled as a frontier garrison by Ming Dynasty troops to guard against the incursions of nomadic peoples. Today, the area is at the frontier of China’s urbanisation drive. While most reports focus on urbanisation in China’s populous east, the vast open spaces of western China can no longer escape the plans of China’s bureaucrats to bring urban development, and with it a consumer economy, to the most remote corners of Qinghai, Tibet and Xinjiang. China’s push to urbanise villagers in remote areas is done in the hope that economic growth will follow, and living conditions will improve. In many respects, this has happened. But relocation is also having a harmful impact on the environment and culture of these regions. In Tongren’s Guomari village, a walled town of earthen homes of the Tu people (closely related to Tibetans), a new town is being built to relocate farmers and herders to more “comfortable” housing. Because the design and planning of the town ignored villager’s needs, many of them are refusing to move, at least for now. The man said that when it rains the house floods because it was built on low ground, and that the brick walls are too thin for the climate. He paid about US $2,000 while the government paid about US $8,000, a pretty good deal compared to other relocated farmers who sometimes shoulder up to 75% of the cost of houses that can be US $20,000, or 20 times a typical villager’s annual income. The old town is built around a monastery and temple, the stupa of which is visible from around the surrounding valley. 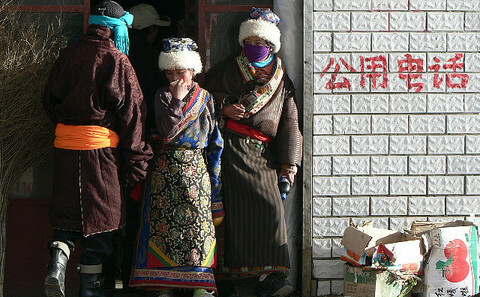 Like many communities on the Tibetan plateau, religious traditions shape the routines of daily life. Townspeople awake before dawn to make rounds spinning the prayer wheels at the temple. Monks make their way to and from houses in the village. But the design for new resettlement housing, while offering certain modern amenities, does not accommodate any of these cultural practices. The new town is made up of rows of identical rudimentary brick courtyards along the main highway leading out of the secluded valley. Decorative Tibetan-style gateposts mark the entrance, but the further one moves away from the road, the more barren the community becomes. Across Qinghai province, which is home to more than one million ethnic Tibetans and other nomadic peoples, nearly 300,000 nomadic herders have been resettled since 2000, with the government planning to move 100,000 more by the end of 2013. About 50% of people in Guomari now work outside the valley, many in the coalmines of Inner Mongolia. But unlike peasants from areas in central China, Tibetans and Tu peoples are much less likely to end up in coastal cities like Shenzhen or Shanghai. The language and cultural barriers make it much harder for them to adapt to factory jobs and other occupations requiring Mandarin. While these programs are ostensibly about improving people’s material conditions, a deeper process is also underway: a transformation of the relationship of ethnic minorities to the land, and with it, their relationship to the Chinese state. Nevertheless, the changes being wrought in western China are rapidly transforming an entire cultural landscape from a nomadic and village-based culture towards an urban consumer one. Even when economic gains do not materialise, the government continues to justify relocation policies based on environmental benefits. Ecological migration (shengtai yimin) policies have been implemented since 2000 to move herders and farmers off land that is ecologically sensitive, ostensibly to slow the trends of deforestation, declining water resources, and loss of grassland environments. A 2002 revision of the Grassland Law made it easier for the government to relocate herders due to presumed overgrazing. Of course, the paradox at the heart of this idea is that the major cause of such worrisome environmental trends is overwhelmingly the resource strain caused by rapid urbanisation and climate change, not excess grazing or farming. Moving herders off sensitive grasslands, or down from the mountains may seem like good environmental policy. But living in apartments, they will use more energy and produce more waste than ever before, outweighing any benefits achieved from reduced grazing or farming. And that’s partly the point: new urban residents will pay higher utility costs and higher taxes, a boon to local government coffers. Environmental activist and journalist Wang Yongchen has visited Qinghai many times over the years to record changes in the environment, river system, and conditions of local farmers and herders. In Guide county, adjacent to Tongren, she documented the creeping desertification and pollution of the water caused by the Longyang Gorge Dam begun in 2001, and observed the dilemma in relocating residents displaced by such projects. In addition to desertification, fencing and enclosure by mining and other state companies has made it harder for herders to graze their flocks in open pasture. Herders are being relocated not in order to protect the environment, but as collateral of environmental management policies that make their livelihood impossible. Scientists say desertification of the high-altitude meadows is accelerating climate change and will have a profound impact on the area. Jonathan Watts talks with nomads who’ve seen changes right below their feet.